The New York Times Magazine has an 7 page article on Afghanistan and the opium crop, with a headline asking if the country is a "narco state." 1. Inform President Karzai that he must stop protecting drug lords and narco-farmers or he will lose U.S. support. Karzai should issue a new decree of zero tolerance for poppy cultivation during the coming growing season. He should order farmers to plant wheat, and guarantee today’s high wheat prices. 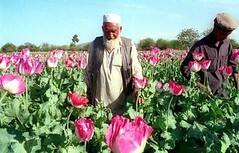 Karzai must simultaneously authorize aggressive force-protected manual and aerial eradication of poppies in Helmand and Kandahar Provinces for those farmers who do not plant legal crops. 2. Order the Pentagon to support this strategy. Position allied and Afghan troops in places that create security pockets so that Afghan counternarcotics police can arrest powerful drug lords. Enable force-protected eradication with the Afghan-set goal of eradicating 50,000 hectares as the benchmark.